One of the benefits of doing this Teen Skin Series was the opportunity to talk to brand founders and ask them for advice relating to the problems teen skin faces, as well as learn how to help teenagers deal with this precarious stage in their life. 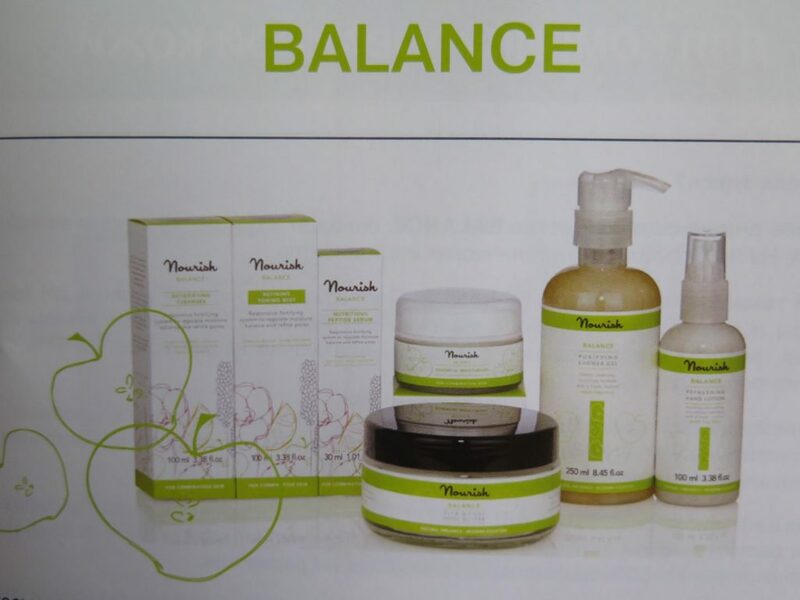 Doctor Pauline Hili, founder of Nourish Skincare, was very kind to write for my website about Teen Skin and I also want to thank lovely Lily who got to test Nourish Balance Mini – Kit and Kale Enzymatic Exfoliating Cleanser in the midst of her A-Levels and still managed to find the time to write her feedback. The age of thirteen to nineteen marks a period of change, it is a time when hormones, which lead to maturing changes in our bodies & as a consequence, our skin, are released. Sadly, Acne vulgaris is a very common disease when an adolescent reaches puberty – 85% of people develop acne at some point between ages 12 to 25. Facial skin contains many sebaceous glands that release sebum: when in balance, sebum makes the skin soft & supple, as well as offering a protective function. When over-secreted, it makes the skin look oily and can lead to acne. The oils in the skin carry dead skin cell debris to the hair follicles but sometimes end up blocking them. This results in formation of an enlarged hair follicle & leads to the onset of formation of a pimple or acne. The main cause of acne is often attributed to hormonal changes, but factors like diet, cleansing habits and stress can often contribute to this skin condition. At Nourish our approach to helping the skin through teenage years is to use a combination of active, plant-based ingredients and vitamins that help manage the cause and the symptoms of acne. Niacinamide ( another name for Vitamin B3 ) is an essential vitamin found in our body and skin, that promotes cell communication, elastin production and healthy skin barrier function & has been clinically proven to reduce acne. Vitamin B3 is also important for reducing age-related degradation of NADH & NADPH enzymes in the skin layers, which are important to cell growth and maintaining a healthy support barrier in the skin. Tocopherol Acetate ( Vitamin E with acetic acid ) is a natural preservative and moisturising agent that protects the skin from free-radical damage and reduces the inflammation caused by acne. It also increases cell regeneration and protects skin barriers. topical application of vitamin C is 100 times more effective for the skin than taking it orally? This molecule, when absorbed by the skin, forms ascorbic acid, a known antioxidant, that protects the skin from the effects of inflammation, photo-ageing and UV damage. It also stimulates the production of collagen in the dermis. Vitamin C is an essential vitamin in our diet, as well as our skin care routine. Calcium pantothenate (Vitamin B5) is another essential vitamin in the skin and body. When applied topically, vitamin B5 reduces pore size, whilst stimulating wound healing and cell proliferation. Within the body, Vitamin B5 regulates a number of hormones and fatty acids that are associated with the sebaceous gland and acne, therefore topical application of this vitamin can assist in returning sebum production to normal levels, reducing oiliness of the skin and acne breakouts. Pyridoxine Hydrochloride (Vitamin B6) is an essential nutrient that plays an important role in regulating our nervous system and the formation of new cells. When applied topically to the skin, it balances sodium and potassium levels, increases red blood cell production and soothes irritation. Apple Fruit Powder (Pyrus malus fruit powder*) is derived from the skins of apples and is a natural source of antioxidants and essential vitamins. Apples have a number of active ingredients, including alpha hydroxyl acids, which refine and rejuvenate the skin, counteracting the effects of acne. Lily’s feedback: Nourish – lovely to use, love that it was all natural, but wasn’t very effective for my combination skin. Kale Enzymatic Exfoliating Cleanser – big fan of this! Skin feels lovely and smooth afterwards. The packaging suggests that you should use it everyday, which I suppose is why it is quite gentle. In order for it to be my permanent exfoliation, I would prefer it to be a bit thicker, more of a face scrub, so that you really feel you are getting dead skin off. Cleanser – Although it smells lovely, I was not convinced by it at all. It didn’t really get my makeup off ( and I wear very little! ) and I started to get breakouts after a few days of use ( this could however be exams/hormone related! ). Toning mist – this was nice smelling and refreshing. Moisturiser – this has a lovely creamy feel, a nice smell and feels great when first applied. After about a minute or so I can still feel it on my skin though, as if it has formed a layer. Peptide serum – I know peptides are naturally derived amino acids, but the name really reminded me of chemicals, although maybe that’s just me. I applied this for a few days and it was perfectly nice to use, but I didn’t notice any changes or improvements to my skin.